At Radio Communications of Virginia, we know that running your business efficiently and safely depends on reliable communications. 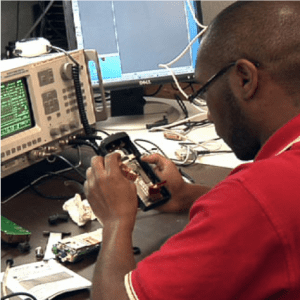 Radio systems need to perform at the drop of a hat, without any risk of interruptions or outages, which is why we offer dependable, in-shop device repair, maintenance, and service for all of your Motorola radio needs. In-shop service from an authorized Motorola Service Center means having a team of skilled technicians who know your Motorola device inside and out. Our highly trained service technicians go through an abundance of yearly Motorola led training programs to provide up-to-date expert troubleshooting and repair for your Motorola products. Leaving you peace of mind that your investment is in quality hands. With Radio Communications making the investment in state-of-the-air diagnostic equipment, you can be sure that our technicians are equipped with the best tools available. Our equipment goes through regular calibrations and maintenance, which ensures our service and repair is accurate and precise. With direct access to original Motorola factory parts, Radio Communications can assure that your repair is completed properly and to manufacturers specifications, which increases the longevity and performance of your radio device. Radio Communications of Virginia prides ourselves on quick repair turn around and strives for a consistent 48-hours turnaround in most device repairs. When you buy two-way radios to handle the communications for your business, make sure that you work with Radio Communications of Virginia whenever you need expert in-shop service. Contact us today!